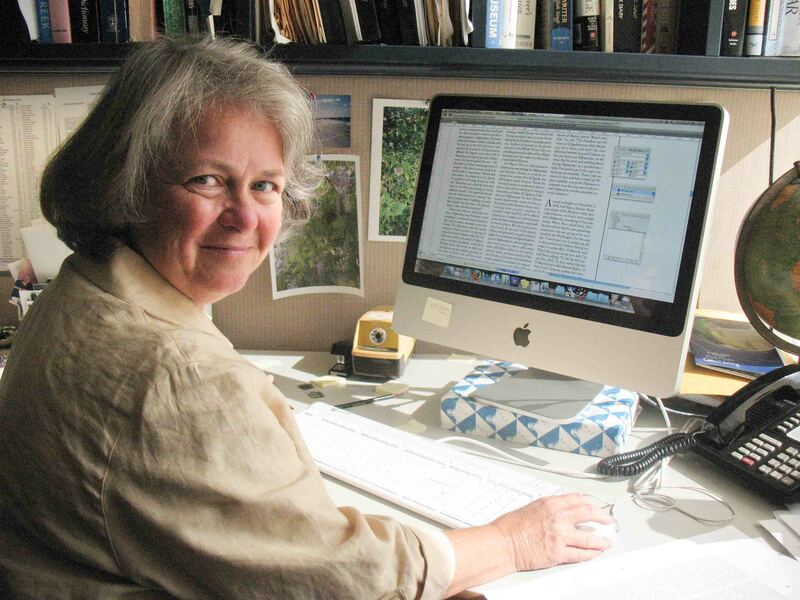 Several years ago we interviewed Mary Norris, copy editor at The New Yorker. It was our most popular blog post ever with over 50,000 views. I think the success of the blog partially inspired Mary to put her thoughts and experiences on paper. 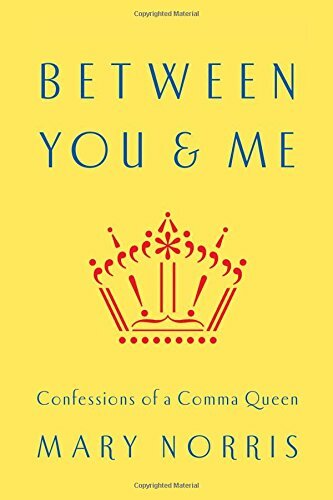 This week, Mary’s book, Between You and Me: Confessions of a Comma Queen was released by W. W. Norton. An excerpt of the book recently appeared in The New Yorker. Mary tells us of the titanic battles over the elements of style: who vs. whom, that vs. which, the fate of the hyphen in the modern world, and all things having to do with the comma. It’s also very funny. I squealed with glee as Mary succeeded (as many in the past have failed) to explain the difference between restrictive versus non-restrictive clauses. She also includes lots of stories describing the punctuation battles at The New Yorker with such great writers as: Pauline Kael, Philip Roth, and George Saunders. Andy: Mary, congratulations on Between You and Me. Every writer I know has been waiting for this book to get published. OK. Let’s not beat around the bush. Let’s begin with the mother of all punctuation battles, the controversy that has been causing the end of lifelong friendships, the issue of the Oxford Comma. Where do you and The New Yorker stand on this? Mary: Hi, Andy. I can’t believe how passionate people are on this subject. I prefer to call it the serial comma, because the Oxford comma sounds sort of upper class, and though the use of the serial comma may mark a person or a publication as somehow particular or formal, it is really a down-to-earth practice, which keeps you from having to think about whether or not a series is ambiguous. It probably isn’t ambiguous, but that final comma before the “and” gives structure to a series, in my opinion. The use of the serial comma is The New Yorker’s preferred style, and I am sticking with it. Andy: And while we are talking about commas, you seem to think that the world of writers can be defined by the general attitude toward the comma. There appears to be two schools on this, right? Mary: Commas are for clarity. There are writers who use punctuation for cadence and writers who use it to reinforce grammar, and there are writers who blend the two approaches. There are many conventional uses of the comma that people waste time arguing about. I know it sounds stuffy to say that we use the comma because we’ve always used it—in a date, say (between the date and the year, and then again after the year, the second comma finishing what the first comma started; the British write the date before the month to avoid that comma), or between title and author (I’ll go with the obvious: Between You and Me, by Mary Norris)—but there really is no reason for some commas besides tradition. Untraditional punctuation can be fun, but it can also be distracting. Andy: Since joining The New Yorker more than 30 years ago, what are the most interesting changes you have witnessed in grammar and usage? Mary: I think the most persistent effort at change is going into trying to solve the problem of the genderless third-person singular pronoun. It is unlikely that a new pronoun will catch on, and people find it cumbersome always to say or write “he or she,” “him and her,” “his or hers.” Some have started using the feminine pronoun once in a while to fight sexism, and I’m for that. Others are talking about the “singular their,” which we use all the time in conversation (“Everybody takes their time on the subway stairs”) but try to avoid in print, because the grammar calls for a singular that doesn’t exist. The spoken language forges ahead while the written language, when carefully edited, is more restrained. I think it’s going to go on this way for a while, but the spoken language—common usage—seems to be winning, and some venerated copy editors are even trying out the “singular their” to see if anybody notices. Andy: Give us writers some advice. If we have only one reference book on style, which do you recommend? And the best dictionary? Mary: I like Garner’s Modern American Usage. It’s thorough and clear on all the issues, and it has backbone: Garner is a conservative in matters of usage, yet he gives space to other points of view. His citations are numerous, and he uses an asterisk to mark the faulty passages, so that you don’t get mixed up. When I read Fowler, I sometimes can’t tell whether he’s citing a passage in approval or denigrating it. And Merriam-Webster’s is the great American dictionary. I still like to look things up in a desk dictionary, but the new online Webster’s Unabridged is superb. Andy: Can you describe for us what a typical day is for you at The New Yorker? Mary: The hours at The New Yorker are from ten to six, and I try to be on time, as it is embarrassing to be chronically late when you don’t have to be at the office till ten. We have a weekly schedule for closing the contents of an issue in an orderly fashion: fiction closes early in the week, critics at midweek, and the longer, more demanding pieces near the end of the week; Talk of the Town and Comment go to press last, on Friday. The head of the copy department, Ann Goldstein, parcels out the week’s tasks, matching up who is available with what needs to be done. If the lineup changes, we readjust. Andy: You have worked under William Shawn, Robert Gottlieb, Tina Brown, and David Remnick. Do you have a sense that there was a “golden age” of TNY or are we living in it now? Mary: Hmmm. Sometimes when I have occasion to look back at an issue from the Shawn days, I am moved by the beauty of those vintage magazines: the lines of type were fitted character by character, the hot type is very alive, the black-and-white columns of print have a classic purity. Bob Gottlieb was careful to maintain that, though he introduced some changes. Tina Brown brought in color and photography, and shortened the length of pieces (and probably the attention span of the general reader). I think that what David Remnick has done is bring his newsman’s nose to the job. Remnick has succeeded in making The New Yorker a vital part of the national conversation. We seem to have found our voice after 9/11. On the other hand, you find fewer quirky pieces that may not be particularly newsworthy but that readers love. For instance, “Uncle Tungsten,” by Oliver Sacks. (I still regret making him spell “sulfur” our way, with the “f,” when he wanted to spell it the old-fashioned British way, “sulphur,” which he’d grown up with.) Ian Frazier’s two-part piece on his travels in Siberia is a good recent example of a beautiful, funny, interesting, old-fashioned piece of writing. A good writer can make you care about anything. Andy: What do you think are the most common mistakes writers make with style and punctuation? Mary: Now that I am on the other side of the pencil, having my prose scrutinized instead of scrutinizing the prose of others, I think people should be more tolerant. You can be too rigid in matters of punctuation, and I continue to be bemused by how much people care about it and how sometimes a sentence’s punctuation gets more attention than its meaning. The letters I’ve gotten about an extraneous comma between the two elements of a compound predicate! The letters I’ve gotten about using “gotten” instead of “got” for the past perfect of the verb “to get,” and vice versa! (Some people can’t stand “had got” and prefer “had gotten,” which The New Yorker style book characterizes as “country style.” That is a usage I have started to defy.) But here I am, using up my lifetime quota of exclamation points, so I’ll just say thank you, Andy, for getting the ball rolling (cliché!). It’s heartening to see that there is such passionate interest in matters of style. Sometimes it looks as if everyone wants to be a copy editor. This entry was posted on April 9, 2015 at 8:49 am and is filed under Interviews. You can follow any responses to this entry through the RSS 2.0 feed. You can leave a response, or trackback from your own site. Really interesting to hear about things from the other side. My life has been split between the UK and USA, so I’m very conscious of the differences in both spelling and punctuation. It was great to hear that a genderless pronoun is being discussed, but I’m always encouraged when I see she, instead of he. Give us a couple of decades of that and then we can talk:-) Thanks for a great interview Andy. Thanks A.K. I love Mary’s book. Ӏ am actually thankful to the holder of this web page who has shared this wonderful piecе οf writing at at this pⅼace. Our focus in retailer is offering glorious customer support and credible health advice. Mrs Mary Norris could you please contact me??? James Collier 317-681-0307. I need a lawyer like you to help me on my book.